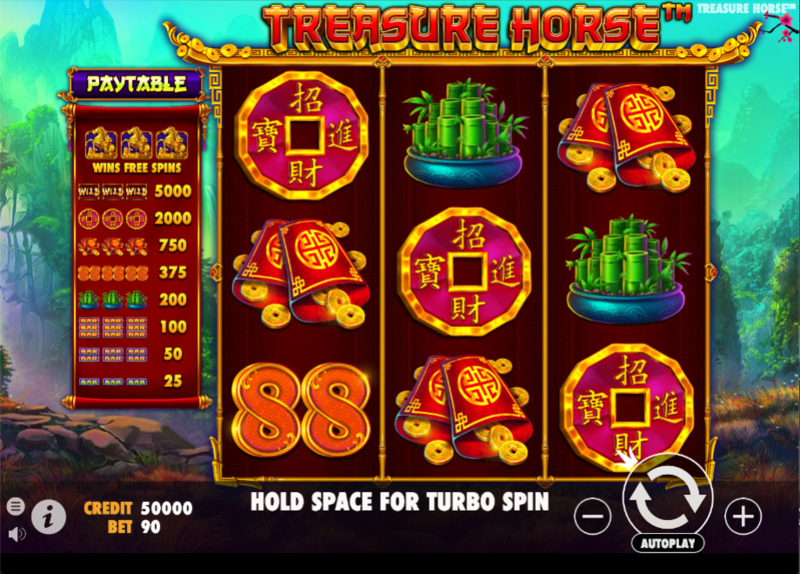 We’re heading back in time and a long, long way east now as we take a look at this oriental-themed online slot from Pragmatic Play; it’s called Treasure Horse and it comes with wild symbols and free spins to brighten your day. Treasure Horse is a three reel slot with three rows and eighteen fixed paylines; an ornate, golden frame borders those reels which float against a backdrop of a hazy green valley wedged between lofty mountain peaks. The Chinese background music is enhanced by forest and waterfall noises to provide the complete effect. There are four theme-related symbols including a gold coin, a some money pouches, a lucky ’88’ and some Bonsai trees; single, double and triple bars make up the lower values. The wild is a big, gold ‘Wild’ which will substitute for all others to help form winning combos except for the rearing Treasure Horse scatter symbol. The biggest payout is for landing three wild symbols on a payline. This is triggered by landing three of the Treasure Horse scatter symbols anywhere in view for which you will receive an initial eight free spins; the big news during this round is that a fourth reel appears which contains only multiplier values – the multiplier value on that reel will be applied to any wins on that spin. All symbols are stacked during the spins and every Treasure Horse which lands will award one extra spin. Treasure Horse may only have three reels but it’s a bold and colourful slot with sound effects which draw the player in very effectively; wins hit more regularly than the usual three reeler so if this takes your fancy then stop by for a bit.